I think you forgot a very important totally free and secure blogging site, Kidblog. We have been using it for at least three years. Easy to set up and manage. Added. 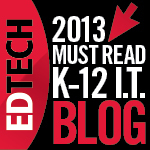 I use Edublogs so didn’t originally consider it. Thank you for doing this work for us. I get frustrated when I want to have my students create different projects and then find out I can’t because of email or other restrictions. This helps out quite a lot. Evernote is a great note taking tool that is web based an can be used on the the iPad. Accounts are allowed with parents permission or schools can create student accounts; however it must be a part of the AUP. Thank you for taking the time to create this list. Nothing is more discouraging than to create lesson, perfect the workflow on to find out that the applications you are planning to use are not for the elementary school student! Added. Like Dropbox, the policy is a little confusing but as you explain,cwithvright permission and user policy, seems to be allowable. Wish these sites would be clearer. Love Evernote. Haven’t used it with students yet. Our policy is that if a teacher wants to use Popplet with students under 13, the teacher just needs to create the account for the student and be responsible for the students use of it. Let me know if that doesn’t answer your questions. Makes me wonder why the policies can’t just say it like this instead of all the legalistic jargon that just scares us off from using sites. No probs, Chris. We were the same last year. Students were Xtranormalling everywhere before I found out it was not for under 13s ( and I found some ‘interesting’ public animations for adult viewing. For years no one has ever read those long winded terms when installing software or using web tools. No one cares at home bu when you are responsible for other people’s kids, you have to be aware. Thank you for this Mark, a comprehensive and useful list. it is relieving to know that we are on the right track at my school with what we are currently using, although given the number of websies one would imagine there would be way more. Have you checked out photopeach and themeefy? As a 5 th grade teacher, I really appreciate this list. I also appreciate your introduction to Andertoons.Those cartoons are hilarious! Also there are no age restrictions on Edublogs. Great List!!! Check out http://www.bubbabrain.com for a simple website that allows teachers to create interactive review games for their students. Hi Mr G, thank you for taking the time to put this post together. Appreciate it! Thank you. This is a very useful reference. With regard to Google Docs, could an under 13 student access a document set up by the teacher using their +gmail account created for the educational Animoto account? Like everything related to these laws, you need a lawyer to work it out😉. Those +gmail accounts to set up other web tools don’t get used to access Google docs; they’re just a method for not using identifiable info about under 13s to cover the other website’s back. I don’t have an answer because I’m not a lawyer. It appears that U13’s can be registered for Schooltube by their teachers. Thanks Megan. I put this together a year ago but will start having a look at sites again and update. There are some new tools I use I’d like to add. Thanks for taking the time to put together this list. Great starting point for teachers! This is exactly why we started KidzVuz.com – the only video site by and for kids. We are COPPA compliant, built specifically for kids ages 7-13. And we’re not just COPPA compliant, all of the videos are watched by a member of our moderating team before being published so we can make sure that kids do not reveal personal info in the videos, and all comments are read to ensure there’s no bullying. It’s distressing how few teachers know or understand COPPA law and ask their students to make videos on YouTube, or tweet or create Facebook posts. Last month I wrote an entire post about a professional development “expert” who was telling elementary school principals that 1st grade teachers should be using Twitter as a teaching tool. It’s both illegal for kids under 13 to be on twitter – and unethical for teacher to be encouraging it. There are tools out there for kids under 13 – but teachers need to know about them, and be given better resources to both discover and share them. Your list is so very helpful. Do you have any recommendations for online simple audio recorders? This would be for world language teachers who want their students to quickly and easily open their Chromebooks and record something they have been practicing, either alone or with a classmate. There are over 13 and over 18 tools but I am stumped. Vocaroo may be my favorite if students can save file in Google docs and turn in. http://www.recordmp3.org/ is another option. 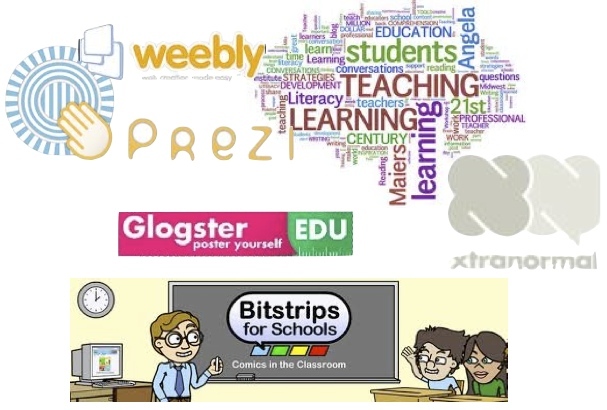 Prezi is free for basic and Edu accounts – I give the students my account details and we all share the one account. Prezi IS actually okay for under 13’s with parent permission anyway..I checked with them this year and they said WITH parent permission its fine. 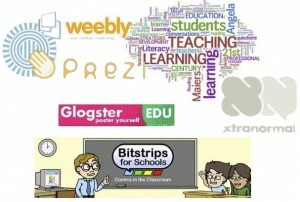 When considering the under 13 crowd you might want to check out my wiki (LHoule’s Wiki) at http://lhoule.wikispaces.com/NO+Registration+Necessary where I have listed over 240 web 2.0 tools that require no registration.